What is EKG Stress Testing? Stress testing is a painless, safe method to measure how well the heart responds to an increase in the body’s demand for oxygen. Exercise is the most commonly used method of creating this increased stress on the heart. The electrocardiographic (ECG) stress test is the second most-performed heart diagnostic test next to the resting, or standard, ECG. The person taking the test may choose to stop the ECG stress test at any time. ECG stress testing is painless, has little risk, and does not use radiation. In the testing room, approximately 10 electrodes are attached to the person’s chest and back. 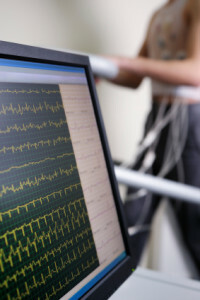 The electrodes record the heart’s electrical impulses and transmit them to an electrocardiograph, a machine that turns the impulses into waves on graph paper or on a monitor screen. Time is recorded horizontally, and the duration and intensity of the heart’s electrical impulses is recorded vertically. People will also wear a blood pressure monitoring cuff or monitoring device during the test. As exercise begins, the patient walks slowly on the treadmill. The speed and incline of the treadmill increase slowly, typically about every 3 minutes. The test ends once the person cannot continue because of fatigue, shortness of breath, or chest pain. The physician evaluates the test results and discusses them with the patient after the test. One disadvantage to ECG stress testing is that recordings can appear normal despite the presence of some heart dysfunction, which is called a false-negative result, or show an abnormality when there isn’t one, called a false-positive result. Stress ECGs produce a high rate of false-positive results in women. In some cases, additional testing may be required. It is recommended that people wear clothing that is comfortable to exercise in and avoid strenuous exercise and eating or drinking, and using tobacco products for approximately two hours before the test.